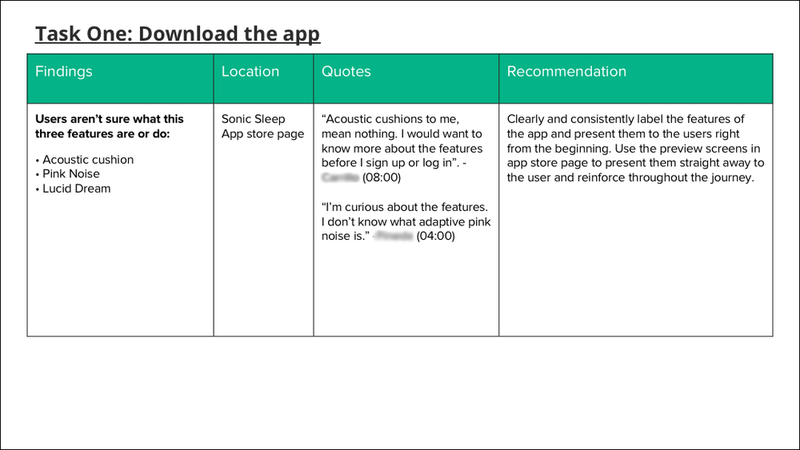 Sonic Sleep is a personalized sleep assistant app for smartphone and Apple Watch aimed at improving sleep quality and giving users a deeper, more regenerative sleep. During the night, the app will play different sounds based on your brainwaves in order to cancel external noise and improve the user’s sleep and helping them waking up better rested and more relaxed. The founders of this New York-based startup hired me to help them update and improve the design and usability of their interface. As they had a version of their app already live, I recommended that we started the design process by identifying their current users and doing a series of user tests with them. This would help us understand who is using the app and where they find problems or get lost. Additionally, it would allow us to pinpoint specific challenges and misunderstandings that the user encounters throughout their experience with the app. Apart from improving the user’s experience, the updated design also helped the app reach #23 in the most downloaded health and fitness apps in the app store.